Roger Mortimer – History… the interesting bits! Anna Belfrage is a master storyteller. She has the ability to weave a tale that draws the reader in from the very first word. But with Under the Approaching Dark she has surpassed herself. She has created a masterpiece of historical fiction. The story entices the reader in and takes them through the full range of emotions in this marvellous adventure, not letting up for one moment. 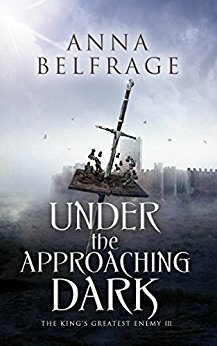 Under the Approaching Dark is the 3rd book in her King’s Greatest Enemy series telling the story of Kit and Adam Guirande, and of Roger Mortimer, the man who dethroned a king and became lover of a queen. 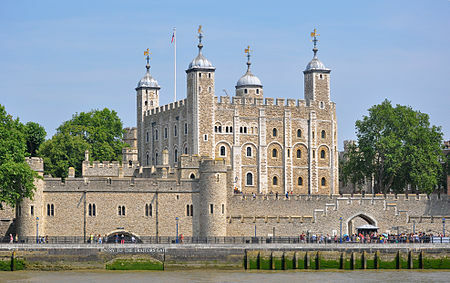 With Kit as one of the queen’s ladies and Adam as Captain of the future Edward III’s guard, the couple are at the centre of events, juggling their public life with their family life. Kit and Adam are living in some of the most turbulent years of English history; they must stay together to survive against jealous rivals, vengeful enemies and the political machinations of the powerful elite. This story had everything: love, war, suspense and intrigue – and a few twists along the way. One of my big questions before reading the book was how the fate of Edward II would be decided – and it didn’t disappoint. I won’t spoil it for you, but I love how the story unfolds; it is plausible, thoughtful and intriguing. Anna Belfrage makes her characters human. They are not perfect, they have the same doubts, insecurities and complicated personalities and relationships as in real life. They develop, adapt and grow as events and the years unfold, their experiences sometimes weighing heavily upon them; their past, their future and their relationships. The author really gets into the hearts and minds of her characters and takes her readers with her, taking them on a rollercoaster of emotions along the way. A number of scenes will bring a tear to the eye, while others will have you reaching for your sword. Despite the momentous times in which they are living, the story revolves around Kit and Adam, their relationship and the trials they face, both together and apart. 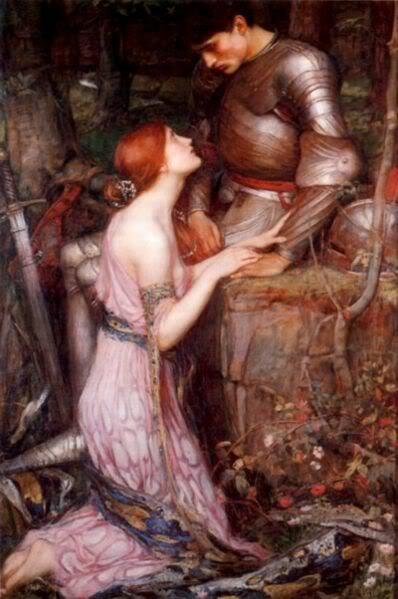 They are an impressive couple, but firmly placed within the boundaries that 14th century society dictate. You won’t see Kit wielding a sword, but, as a result, she has more subtle weapons at her disposal. With each step, the coil of hair grew heavier, and when one of the older ladies gave her a long look accompanied by a pursed mouth and raised brows, Kit regretted having followed Lady Margaret’s advice. Too late. She swallowed. Adam was saying something but stopped mid-sentence when he saw her, and Kit felt her cheeks heat. Would he deem it inappropriate? Chide her? She made a reverence; his hand shot out to close around her elbow, steadying her as she straightened up. “But I’ll not have my wife walk about unveiled,” he continued, guiding her back towards the door. Anna Belfrage is meticulous in her research and includes many of the often overlooked details of medieval life – such as the prohibitions against marital ‘relations’ during Lent, or the length of time it would take a rider to get from York to London. Her descriptions of the cities visited by characters, such as York and Lincoln, are incredible – you can almost feel yourself transported to Clifford’s Tower or standing in front of Lincoln’s imposing cathedral. Under the Approaching Dark gets everything right. The interaction between the characters is stunning, each having their own traits and quirks which play out in the dialogue. The love scenes are tender and tasteful and the action scenes are fast, furious and full of tension. You never know what will happen next, or how things will play out; which makes the book a true page-turner right to the very end. The author’s skills at storytelling are exquisite; she draws you in with her words, transporting you back in time and showing you a world that has long since disappeared, but has been brought back to vivid life by the words and imagination of this amazing author. The story grabs your attention from the very first sentence, and will not leave you, not even after the final page has been read. The writing is impeccable. The story has everything. Under the Approaching Dark is just perfect in every sense. Adam de Guirande has barely survived the aftermath of Roger Mortimer’s rebellion in 1321. When Mortimer manages to escape the Tower and flee to France, anyone who has ever served Mortimer becomes a potential traitor – at least in the eyes of King Edward II and his royal chancellor, Hugh Despenser. Adam must conduct a careful balancing act to keep himself and his family alive. Fortunately, he has two formidable allies: Queen Isabella and his wife, Kit. England late in 1323 is a place afflicted by fear…. Tired of being relegated to the background by the king’s grasping favourite, Isabella has decided it is time to act – to safeguard her own position, but also that of her son, Edward of Windsor. As Adam de Guirande has pledged himself to Prince Edward he is automatically drawn into the queen’s plans … Once again, England is plunged into war – and this time it will not end until either Despenser or Mortimer is dead…. 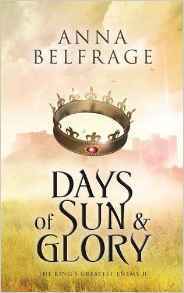 Days of Sun and Glory by Anna Belfrage is the 2nd book Anna’s latest series, The King’s Greatest Enemy. In the Shadow of the Storm saw Adam de Guirande, a trusted officer of Roger Mortimer, marry Kit de Monmouth and navigate the political climate of rising opposition to Edward II’s increasing infatuation with Hugh Despenser, while at the same time being 2 strangers negotiating the early tribulations and insecurities of married life. In Days of Sun and Glory the crisis in England is worsening; Mortimer is free and on the continent, leaving his supporters to face the suspicions and antagonisms of the king and Despenser. Isabella with her father, Philip IV, and brothers. Days of Sun and Glory is a stunning read; full of action, love and suspense, it has the reader on the edge of their seat from the 1st page – and leaves you there right to the last. This story will have you laughing, crying and biting your finger nails with anticipation throughout. It is a fascinating read that pulls you into the lives of, not only, the central characters, Kit and Adam, but also of the historical characters; Mortimer, Isabella, King Edward and his heir, the future Edward III. Although we see new enemies the chief antagonist remains the same: Despenser. Anna Belfrage paints a picture of Despenser that makes you cringe every time he appears on the page. He is charmingly polite and clever; while being, at the same time despicable and slimy. He will stoop to anything to keep his position and influence with the king; using any weapon available – including children . This is one man everyone loves to hate – except the king and his wife. As luck would have it, they ran into Lord Despenser on their way back to their allotted chamber. Kit didn’t see him at first, she simply felt the muscles in Adam’s arm tense. “If it isn’t my favourite traitor,” Despenser said with a smirk, stepping out to block their path. Adam bowed, as did Kit – protocol required that they do so, even if Kit would have preferred to spit Despenser in the face. This was the man who had threatened her and abused her, who had tortured her Adam, leaving him permanently crippled. Despenser’s mouth curled into a sneer…. And fighting against his schemes are Adam and Kit. The central characters have a love story to rival the greats. However, Anna Belfrage has cleverly placed them in their time and history. In stark contrast to the rebellious Queen Isabella, Kit is the obedient, dutiful 14th century wife – most of the time; while Adam is torn between duty to lord and obligation to family, constantly forced to balance his priorities and overcome his personal feelings. Their relationship makes the book – their love has overcome petty jealousies, personal tragedy, family feuds and the threats of the dastardly Despenser. And behind it all lies Adam’s fears of what would happen if he or his family were to fall into Despenser’s clutches. “It won’t happen,” she said. That made him smile. “My protective wife.” Adam stroked her cheek. While Kit and Adam are becoming old-hands at the political balancing-act, thrown into the midst of it all is Adam’s new lord, Edward; son and heir of Edward II the 13-year-old prince is torn between his parents. While Adam and Kit see a desperate child forced to choose between love of his mother and duty to his father, each parent sees that controlling the son as a means to controlling the future. Young Edward becomes a star of the book; likeable, mischievous and old beyond his years, Anna Belfrage hints at the hero-king to come, while ably depicting the fear and confusion of the child he is. Edward steals practically every scene he is written into. Anna Belfrage has done her research well. 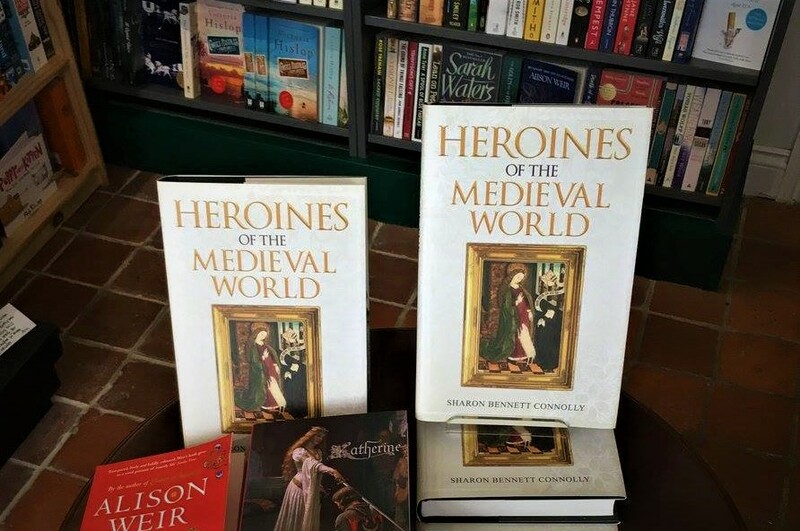 From the historical characters to the marvellous castles and palaces in France and England, Anna brings the 14th century to life in vivid, entertaining and exciting language. The best and worst of human strengths and frailties are characterised within the magnificent castles of Vincennes and Windsor, in the sprawling cities of London and Paris; taking the reader on a wild ride through the French and English countrysides, with spies, poisoners and the possibility of ambush just around the corner. While the reader may know the history, Anna Belfrage tells the story in a manner that will always leave you wondering what happens next. She gets under the skin of her characters, both historical and fictional. Her sympathetic portrayal of the characters and events takes the reader through a whole range of emotions; fear, anger, humour, awe … and love. Tears and laughter are never far from each other as the lives of Kit and Adam are revealed before us. Engaging and entertaining, Anna Belfrage has created a masterpiece in Days of Sun and Glory, a book which is impossible to put down, but which you do not – ever – want to end. Anna Belfrage is the author of the extremely popular time-travelling series, The Graham Saga. To find out more about this incredible author and her books, please visit her website. Adam de Guirande owes his lord, Sir Roger Mortimer, much more than loyalty. He owes Sir Roger for his life and all his worldly goods, he owes him for his beautiful wife – even if Kit is not quite the woman Sir Roger thinks she is. So when Sir Roger rises in rebellion against the king, Adam has no choice but to ride with him – no matter what the ultimate cost may be. England in 1321 is a confusing place. 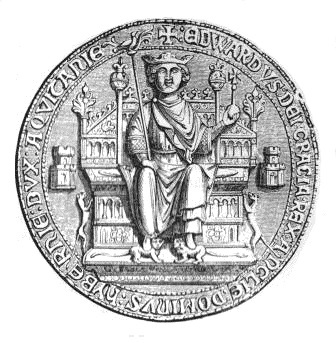 Edward II has been forced by his barons to exile his favourite, Hugh Despenser. The barons, led by the powerful Thomas of Lancaster, Roger Mortimer and Humphrey de Bohun, have reasons to believe they have finally tamed the king. 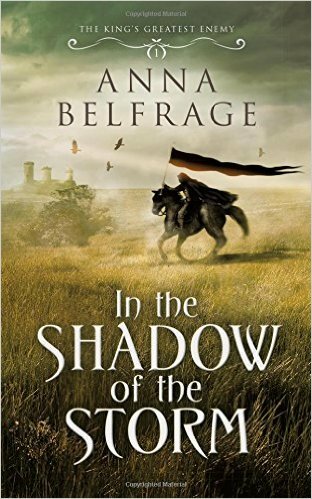 But Edward is not about to take things lying down, and fate is a fickle mistress, favouring first one, then the other… The Welsh Marches explode into war, and soon Sir Roger and his men are fighting for their very lives. When hope splutters and dies, when death seems inevitable, it falls to Kit to save her man – if she can…. 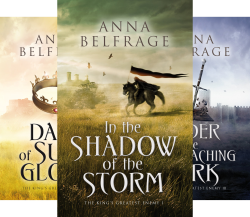 In the Shadow of the Storm is the first book in Anna Belfrage’s new series, The King’s Greatest Enemy, and what a magnificent introduction to Anna’s new heroes and heroines! Set in one the most tumultuous periods of English history, the book expertly blends the personal lives of its heroic couple, Sir Adam and Kit, his new wife, with the national drama of the disintegrating reign of Edward II. I know it’s a bit of a cliché, but this book is impossible to put down. The action and intrigue are, to put it simply, riveting. In the Shadow of the Storm has a great mix of love story and rebellion, and of heroes and villains and a heavy dose of adventure; it has you in tears one minute and on the edge of your seat with excitement the next. Kit is my new hero! In a world where women’s rules were very specifically defined, Kit pushes the boundaries in order to achieve what she wants – but she never quite exceeds them. A young woman kidnapped from her sheltered life and thrown into a marriage to a man she has never met, and into the world of her new husband’s lord; where war, intrigue and a secret threatens to destroy the growing love the couple have for each other. However, not only does she manage to avoid sinking, Kit becomes a champion swimmer. Adam went to the nearby table, sloshed wine into a goblet and drank deeply before passing it to her. “I hadn’t expected to find you a virgin,” he said, eyes the colour of pewter raking her body up and down. “Don’t give me that.” He reclaimed the cup and leaned against one of the bedposts. “Do you think I don’t know about you and Lord Roger?” Not only was he tall, he was big, a thick, fair fuzz covering his chest, the hair darkening closer to his groin. “Lord who?” Kit’s head ached. Adam is a knight sworn to Lord Roger Mortimer, balancing a burgeoning love for his wife and family with his duty to his lord. Kit and Adam are a very real, down-to-earth, young couple; newly married they are still discovering each other. Misunderstandings and insecurities lead to a married life that is anything but smooth. And in the midst of their developing love and trust, they are thrown into the middle of Mortimer’s rebellion against Edward II. Ranged against them are enemies aplenty. Adam’s own step-brother, Guy, has eyes on Kit – and on everything Adam possesses – and will go to extraordinarily vicious lengths to achieve his goal. While the most despicable of all is Hugh le Despenser the younger, Edward II’s favourite and a man with a particular hatred for Adam and his lord. Vindictive and cruel, Despenser is determined to destroy Adam; Kit has to use all her courage and skill to thwart him – and to save her husband’s life. 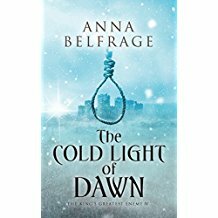 Anna Belfrage manages to weave a wonderful story around the very real history of a desperate time for England and her people. 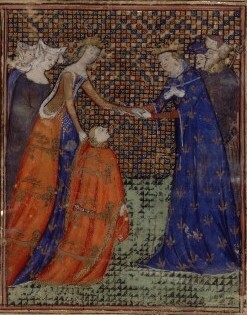 The threats and dangers of living in a divided, unstable realm, with forces polarizing between the king and queen, are vividly depicted, drawing the reader deeper and deeper into the 14th century. The author’s deep knowledge of the period serves to make the reader believe they are actually there, watching the action, weighing the choices and living the harsh reality of a realm on the brink of civil war. The history is impeccable, with Kit and Adam’s story slipping into the historical timeline so neatly that it is practically impossible to see the line where history ends and fiction begins. Anna Belfrage’s depiction of the historical characters is exquisite. Despenser is suitably heinous; he makes your skin crawl when he walks into a scene. Lord Roger Mortimer is determined, charming … and noble. The personalities are diverse and fascinating. The landscapes are so vividly describes as to be dramatic; you could almost imagine yourself riding along the rivers of the Welsh Marches, incarcerated in a dark, cold dungeon, or walking along the main thoroughfare of the ancient town of Shrewsbury. nna Belfrage is the author of the extremely popular time travelling series, The Graham Saga. 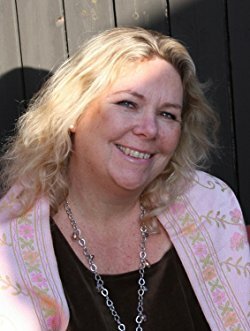 To find out more about this incredible author and her books, please visit her website. 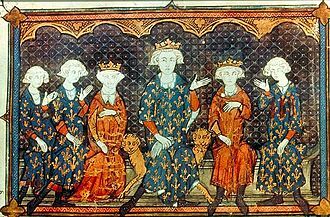 Pictures of Edward II and Isabella of France are courtesy of Wikipedia.